My first ground of 2017 was on Saturday 28th January at Dog & Duck in Wellingborough, Northamptonshire. 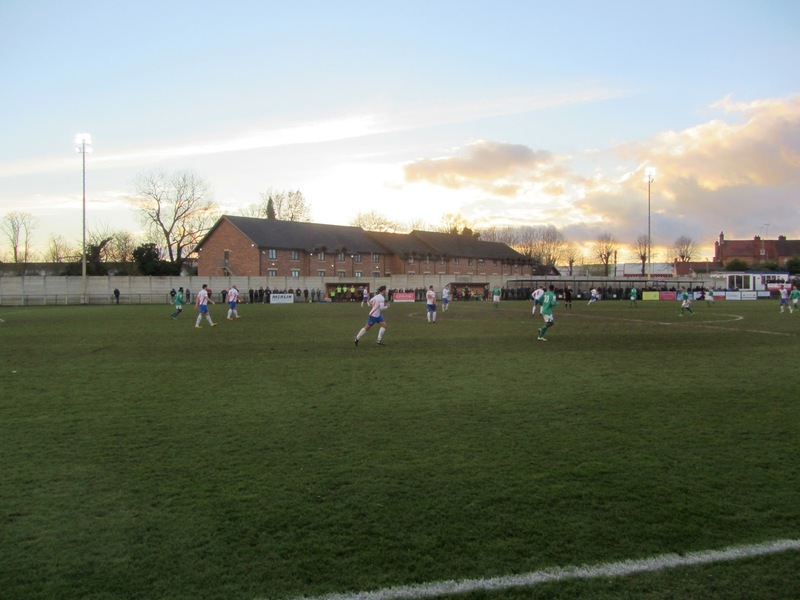 The match was AFC Rushden & Diamonds vs. Loughborough Dynamo in the Northern Premier League Division One South. 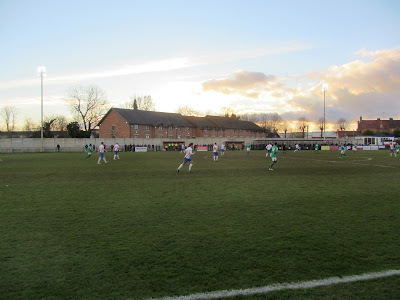 The Dog & Duck is in the south of Wellingborough and is one of two football grounds on the site with neighbours Wellingborough Whitworth FC having a separate pitch on the eastern side of the Dog & Duck. The western side of the ground is directly next to a Beefeater and a Premier Inn with a recently built retail park behind the northern end. The southern end is bordered by fields making it the only side not surrounded by developments. Wellingborough railway station is 1 mile north-east of the ground which was opened in 1901 for Wellingborough Town. AFC Rushden & Diamonds have played at the venue since 2012 though will be leaving in 2017. The entrance to the ground is on the north-west side and there is a small club shop facing outwards close to the turnstiles. Once inside this end has a raised flat platform which takes up the western corner of the ground. On the platform there is the clubhouse, a food outlet, dressing rooms and the players tunnel. Directly behind the goal there is a covered metal terrace consisting of 7 rows of standing. 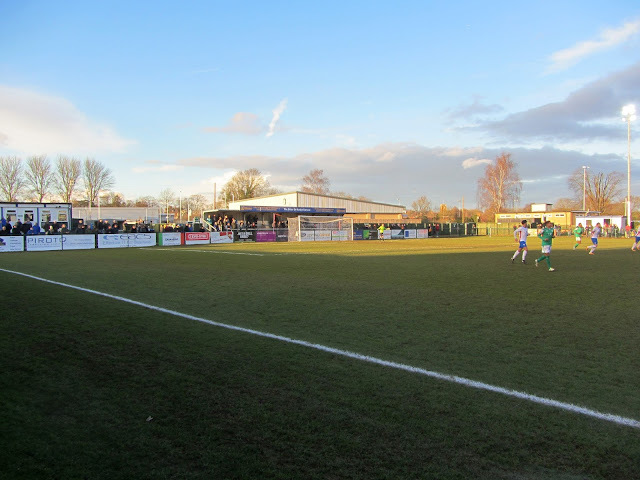 There is a single all-seater stand on the north-east side of the ground. This staddles the half-way line and has 163 seats for spectators including an officials area in the middle and a press box at back of stand. Close to the stand there is an additional beverage area with a demountable known as Dale's Bar. The remainder of the ground are taken up by standing areas with just one covered area on the south-west side running for around a third of the length of the pitch. Due to the Premier Inn car park bordering this side it is fairly tight on space though this ceases as you get to the south-east section of the field meaning a lot of space behind the goal at this end. Rusden & Diamonds took barely a minute to opening the scoring when the first corner of the match was headed clear as far as Joe Curtis on the edge of the box and he returned the ball with a smart volley into the corner of the net. The hosts went 2-0 up in the 21st minute as Fazel Koriya ghosted into the box, fooled a couple of defenders with some nice skill before squaring for Curtis to rifle the ball into the roof of the net from 6 yards out. Loughborough were not holding out well against the R&D attack and conceded again in the 25th minute. This time Curtis was the provider as he ball into the box found Tom Lorraine who was able to control the ball and turn and shoot low past Jack Tolley in the away goal. After racing into a three-goal lead the home side were able to take their foot off the gas a little with their next best chance not coming until first-half stoppage time when Liam Dolman hit the bar with a free-kick. The visitors were much improved and matched R&D as both sides were limited to half chances only. There was one more goal though which came in the 82nd minute when Lewis Lesley lifted the ball into the box and despite no home players being in the vicinity a mix-up in the Loughborough defence saw goalkeeper Tolley and defender Carl Sibson go for the ball at the same time resulting in Sibson heading it over his teammate into own net.